Rains in Kerala have wreaked havoc across the state. In addition to the widespread destruction, the floodwater is likely to be a potent mixture containing hazardous chemicals, electronics, construction debris and more. Additionally, the landfills expose huge amounts of municipal waste to the flood water, which is flowing freely. Who is responsible for the management of this dangerous waste, and is it being done the right way? The floods that ravaged Kerala were ruthless in their destruction. The physical damage to infrastructure is staggering; 11,000 kilometres of road, 237 bridges and over 7,000 houses have been affected. Hitting the agricultural sector hard, the floods have impacted 45,000 hectares of farmland. Moreover, evacuation in urban areas meant citizens had to abandon their residences suddenly, leaving their household belongings like electronics and furniture to be swept away by floodwater or submerged under marshy debris. The total losses in Kerala are estimated to be worth around ₹30,000 crores. The response from the rest of India has been commendable, with thousands of citizens volunteering their services to help bring the situation under control. The Kerala government has requested ₹2,600 crores from the Centre. However, it has only received ₹600 crores thus far. Citizens from across the country have jumped in, raising over ₹700 crores for Kerala. 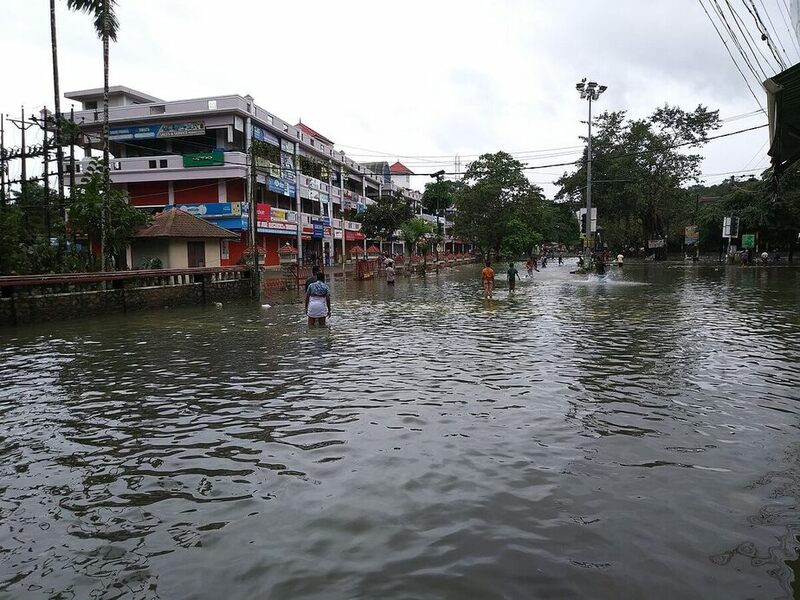 As things stand, with rains still lashing parts of Kerala, the floodwater is likely to be a potent mixture containing hazardous chemicals from household cleaning supplies, electronics and construction debris. 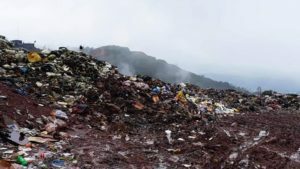 To worsen matters, the landfill-based waste management systems (a pan-India phenomenon) exposes huge amounts of municipal solid waste to the flood water flowing freely along the roads. The floods and subsequent damage begs the question to be asked: who is responsible for this exodus of waste? More importantly, how can it be managed? Technically speaking, it is the state government’s responsibility to oversee the disaster management process. However, the State Disaster Management Authorities (SDMA) depends on the National Disaster Management Authority for further direction and assistance. The NDMA’s guidelines do highlight areas prone to flooding and describe procedures to rehabilitate displaced people and rebuild damaged infrastructure. Unfortunately, these guidelines do not shed any light on waste management, failing to emphasize the importance of waste segregation during such crises. The Kerala Disaster Management Profile Plan also comes up short on this front. 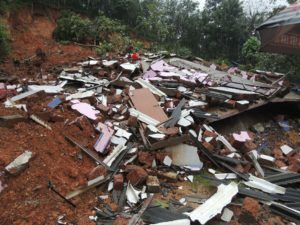 Kodagu (Coorg) district in Karnataka has also been ravaged by torrential rains and subsequent mass landslides, prompting relief centres to sprout. The citizen-run relief centres are mindful of the imminent waste problem and are taking steps to ensure they do their best to mitigate this issue, given the circumstances. A collapsed structure in Kodagu due to the rains. Pavan Aiyappa, tells us that “the Clean Coorg Initiative (CCI) has suggested waste segregation at independent (non-governmental) relief centres to better handle the vast amounts of waste generated.” Unfortunately, governmental intervention in relief and rehabilitation activities has undermined their efforts; once the State government took control over the relief camps, the segregated waste was instructed to be sent to landfills, completely defeating the purpose. Similarly, the Kodava Samaja Relief Centre was told to use disposable cups and plates which they received through donations despite having their own store of steel utensils. Another centre received a surplus of water bottles, which they were instructed to use instead of their own reserves. This not only led to wastage of drinking water — some people used them to bathe — but also resulted in over 40000 used plastic bottles of water finding their way to a landfill. All cardboard, material wastes from relief centres and wet wastes are currently being dumped in landfills. In light of such mismanagement and oversight at the hands of the state authorities, the CCI has drafted and proposed a plan to local disaster management authorities — comprising IAS officers and experts from the SDMA — to initiate proper land demarcation and pocket rehabilitation. “We suggested collaboration with organisations that specialise in installation [of said infrastructure] and asked for their support. We haven’t received an answer yet”, laments Pavan. To be fair to the authorities, in an event like this, the top priority is rescuing and rehabilitating the lives of displaced citizens. This inhibits their ability to tackle important but secondary issues like waste management. The government is further shackled to budgetary restrictions, thus often having to forego certain measures, as they are not cost-effective. For more direction, authorities in Kerala and Karnataka could take cues from the UN’s guidelines on disaster management which describe a detailed stepwise plan for authorities to follow during natural disasters like these. Under the recovery phase, this plan suggests authorities to establish waste segregation and sorting practices followed by proper treatment and recycling once normalcy is restored. While concrete debris can be recycled into construction material, PVC and steel pipes can be melted and remoulded. This step is particularly important as debris when allowed to stay in the soil, will drastically increase the PM levels in the air. Moreover, the debris can develop mould and bacteria, posing a health hazard. Buried waste also allows hazardous non-biodegradable wastes to leach into the soil, which will stay in the ecosystem for decades to come. The way things stand (or don’t) in affected regions like Kodagu, it is impossible to retrieve the debris because the landscape of the entire town has changed completely. The only option available to the authorities is to wait for layers of soil to settle and hope that the landscape is restored, albeit with debris under the soil, which has its own set of problems as warned by the UN’s guidelines. Similarly, given the sheer magnitude of the puddle that Keralites find themselves in, humongous amounts of debris and waste can be expected to resurface after the waters have receded. Combined with the general dampness, such waste will be a fertile breeding ground for disease vectors like mosquitoes, flies and rats. It becomes imperative for the various authorities to act now and arm themselves with a holistic plan to combat the floodwater’s contaminants once the rains have receded. If not met with proactively, the waste and debris could be more formidable long-term enemies than the floods themselves.